Take the guesswork out of your game with a superb Tour V4 Rangefinder, a perfect blend of size, speed, accuracy and technology. 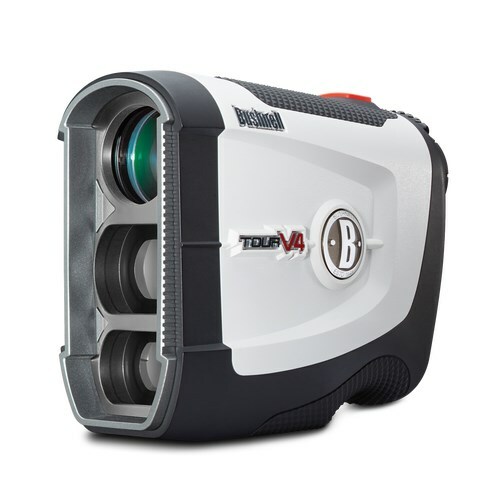 This fantastic Bushnell rangefinder features the superb PinSeeker Technology with JOLT. This will provide you with short vibrating bursts to reinforce that the laser has locked on to the flag so you know you are not getting a distance to a tree in the distance. Thanks to its accuracy, you can be assured that you will get a distance that within 1 yard of your target.The 5 x magnifications makes it even easier to lock on to your target from longer distances, while it can lock on to targets ranging from 5 yards to a 1000 yards with a fast focus system.